Accessory Genie - Consumer Electronics and Accessories Industry News: Creating My Own "Car of the Future"
Earlier this week, I read an article about the Ford Evos, a car that Mashable called the "Social Networking Vehicle of the Future." What does it take to earn this title? The idea of the Ford Evos is for it to always be connected to a cloud and understand the driver's wants needs and interests. It'll keep tabs on traffic and weather that is relevant to where the driver needs to be, know the work schedule, etc. It will also monitor the driver's physical state and will adjust temperature controls and handing to better accommodate them. After reading only the title, I couldn't understand why a person would feel the need to send a Tweet or write on a friend's Facebook Wall while driving. Why can't they just wait until they arrive at their destination to be "social"? But after reading the article, I was much more intrigued by the concept. A car that could work with me to be where I need to be when I need to be there, all the while keeping me comfortable and complacent... Sounds pretty amazing, especially for those of us living in Los Angeles, where getting to somewhere on time is a constant struggle. Unfortunately, it doesn't look like the Ford Evos will be coming out any time soon, if at all. With no Evos in my near future, I decided to take my car and some Accessory Genie products, and make my own "car of the future." I started off with the FlexSmart X2, a wireless FM transmitter that connects to your car through Bluetooth. Aside from playing music wirelessly through your car's speakers, it also enables you to make hands-free phone calls. I also use it with my navigation app to get step by step directions through my speakers. When I want to easily see my smartphone's screen, I mount my phone on the USA Gear Ventmount to look at my screen quickly without taking my eyes off the road for too long. My Ventmount also rotates horizontal to fit my TomTom Navigation system, which I use when I want to avoid as much traffic as possible. To entertain any company I may have in my backseat, I set up my USA Gear TabGRAB, a tablet mount that easily attaches to my headrest and adjusts to securely display my tablet. 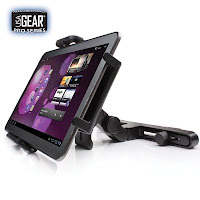 When I wirelessly connect my tablet to the FlexSmart X2, my nieces and nephews will watch shows and movies with what I like to call "surround sound", and I'm left peacefully driving without any fighting coming from the back of my car. With a few products from Accessory Genie, I have my own "car of the future!" Okay, maybe it still doesn't compare to the Evos. But these products do make my daily commute significantly more tolerable. And in L.A., that's really all that matters. I bet we'll be seeing an uptick in tweeted homophone misspellings when that Evo comes out. Also not sure it's such a hot idea to be looking for new ways to distract drivers from their primary task, which should be driving. And yet I'm sure I'll secretly want one.